Are you ready to taste 155 pages of delicious, mouthwatering, fast and simple recipes? 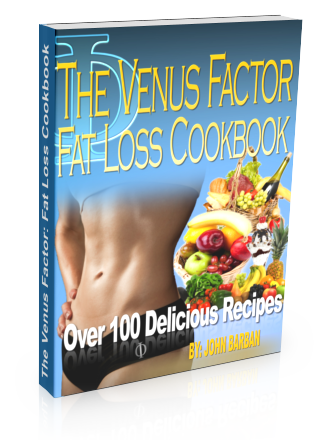 The greatest secret of the Venus Factor Cookbook is that every single recipe will fit seamlessly into your Venus fat loss lifestyle plan to help you lose weight, shed body fat or maintain if that's where you are on your journey. There are plenty of healthy-eating recipe books out there but this is the only one designed by the Venus Index team! We had a blast putting this Cookbook together for you! Here's how the process went down. First of all we sat around a table and discussed our favorite recipes. No holds barred. We weren't thinking about calories at that point. We just wanted to recall our most cherished family favorites, home cooked meals and holiday recipes. You see, we knew that we could design simple, healthy versions which would go hand in hand with the Venus Index nutrition ethos. We didn't want to give you a Cookbook full of shakes, weird combinations, bland flavors and mini-meals. We knew that Venus women want real meals which their friends, kids and partners can enjoy too. Full of taste, satisfying, paying attention to texture and crunch and mouthfeel. All the good stuff which makes eating such a pleasure! An incredible 114 recipes which will fit your fat-loss lifestyle! A full explanation of how we've designed classic recipes with fewer calories than the regular version. There are recipes here for vegetarians, meat lovers, for those of you who prefer eggs to dairy, and for everyone who has a sweet tooth. Venus women don't avoid food groups or cut out macronutrients. They eat sensible portion sizes, fresh produce and home cooked meals. Download this great 114 recipe, 155-page Cookbook now to discover how you can cook all your favorite dishes the Venus Index way. PS: Check out the incredible NY-style cheesecake recipe. It's my favorite!